Fits all elemental walking sticks and most others. Fits all Leki Trekking poles. To fit Leki Nordic Walking poles. Optimised shape for the best swing action. 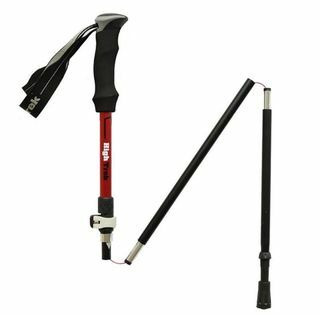 This quality trekking pole has a versatile T-grip handle. The T-grip design allows the pole to be used like a walking stick or trekking pole, providing stability and support while reducing fatigue. The pole includes an anti-shock system to ease stress on your joints and lower back. Tackle more extreme and arduous adventures with the Adventurer. Consists of 3 telescopic sections that are made of durable 7075 aluminium (higher tensile strength than the 6061). The sections lock solidly and securely in place quickly with the cam-lock adjustment system. 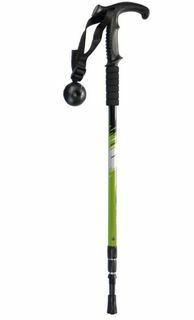 Entry level pole with PA Safety Hard grip and Leki Classic internal locking system. Round Top Comfort Soft grip with positive angle. Leki Super Lock internal locking system. 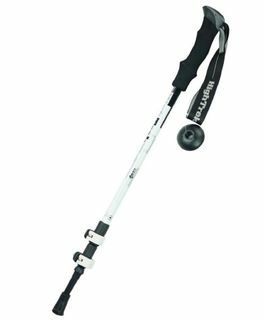 The most compact High Trek walking pole, the Nomad is extremely travel-friendly, packing down to just 35 cm. Made of high-tensile 7075 aircraft-grade aluminium, it features a comfortable EVA ski-grip and adjustable wrist strap. Soft Anitshock Lite in the lower section. The stylish foldable walking pole with height adjustment system. Ultralite pole with Aergon CorTec compact grip. Speed Lock external locking system. Ultralite pole with Aergon CorTec compact grip. Speed Lock external locking system on the middle section, SLS internal locking system in the lower section. Soft Antishock in the lower section. Ultralite pole with Aergon Thermo compact grip. The push-button release mechanism allows for quick, easy assembly and disassembly of folding poles. Thanks to the push-button release mechanism, you can assemble and disassemble it at lightning speed and it even fits in your hand luggage due to its small pack size. Trekking, sometimes referred to as hiking, is an outdoor activity that can take you to the highest mountain or around the local park. Adventure seekers who climb the world’s tallest mountains, casual day hikers who follow a well-defined relatively flat path and active people looking for added support after surgery all benefit from the added balance and stability of LEKI poles. Using Trekking Poles helps distribute weight evenly and absorbs added shock to your knees and back when traveling different terrain. For a better understanding, check out our Glossary and Frequently Asked Questions. Take a look below at the Anatomy of a Trekking Pole and learn more about the basic parts that make up a Trekking Pole.